With members of Anthrax (Scott Ian, Rob Caggiano), Every Time I Die (Keith Buckley), and Fall Out Boy (Joe Trohman, Andy Hurley), The Damned Things are undoubtedly a musical force to be reckoned with. While each individual in the band has experienced their own successes, The Damned Things’ debut Island/Def Jam album, which combines their love of classic rock anthems and powerful melodies with a heavy metal intensity, turns out to be much more than the sum of the separate parts. “This is an amalgam of three very different bands,” explains Fall Out Boy guitarist Joe Trohman, who was first introduced to Anthrax’s Scott Ian three years ago, when the two became fast friends and immediately began writing together. “It seemed unlikely, but it turned out we were on the same page musically. We were both interested in putting together a heavy/classic-rock, blues-oriented, riff-based band while trying to stay away from what makes that sound generic and overplayed.” Here’s a behind-the-scenes look at the formation of The Damned Things as they prepared for the release of their debut album Ironiclast. 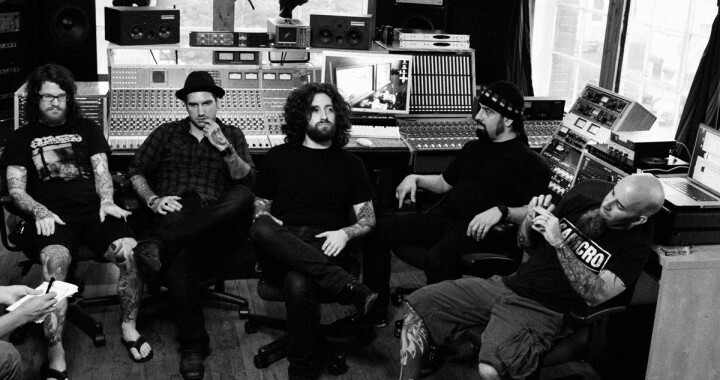 Posted in Artists, Metal, Music Genre, Rock, The Damned Things, Video and tagged Andy Hurley, Joe Trohman, Keith Buckley, New York City, recording studio, Rob Caggiano, Scott Ian, The Damned Things.